Mostly, its our untidy cabinet interiors that pose a problem in our trial to locate the required things that we need to cook delicious dishes. Usually, the cabibet is so haphazardly arranged that we do waste a lot of time in finding the exact accessory that is required, for example, measuring cups. 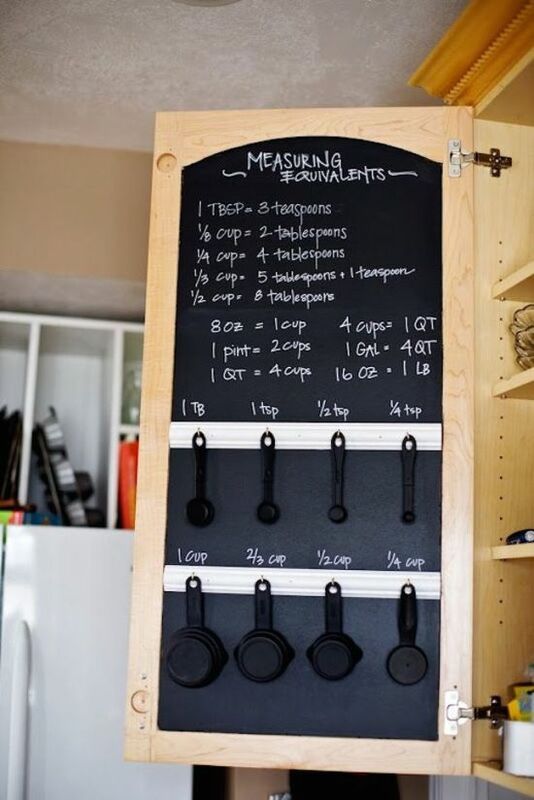 Hence, a clever way to bring some uniformity to the interiors of a cabinet is to decorate it with a theme such as the chalkboard theme seen below where the door of the cabinet has been designed with cups of all measures and measuring equivalents. 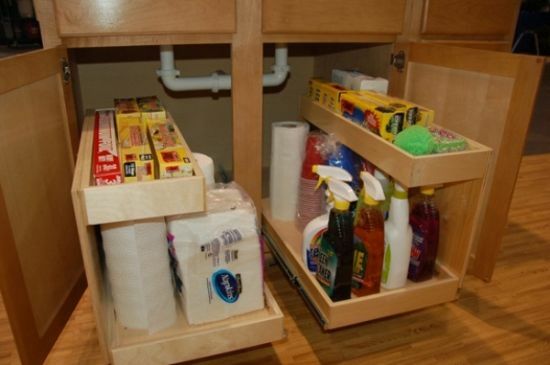 With kitchen cabinet ideas such as this one, you can give more space to your cabinets with storage trays built under your sink just as the one seen below where the trays have been fitted under the sink area to store kitchen items like cleaning soap, detergent, foils and all the things typically used in a kitchen everyday. These trays can go back inside when you close the door and don’t gobble up space. Open kitchen cabinets are very functional and literally force us to incorporate a more arranged look inside. When your cabinets are devoid of any doors, you are bound to keep things like bottles, jars, plates and other cutlery in place since there is every chance for your guests to see how tidy or untidy you are in your kitchen. The image below is that of a beautiful kitchen where the cabinet doesn’t have any door and has open shelves where things are stored systematically. These drawers help in storing a number of things like kitchen utensils, crockery and even towels that needn’t be stored anyplace else. The kick drawers seen in this kitchen are utilized for keeping a number of kitchen accessories like baking tray and other related items of daily use. These help in saving space. 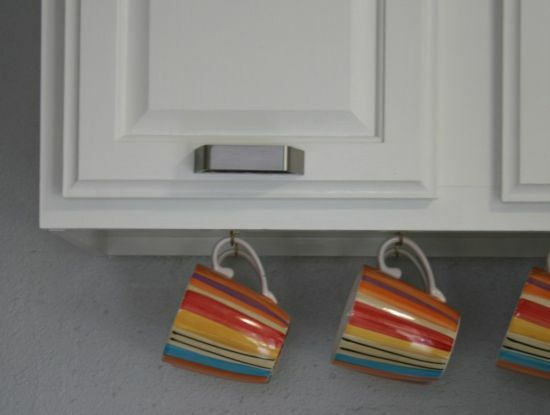 If you can hang your cups under your cabinets, there is nothing like it! Yes, a cabinet that explodes with a dozen cups when you open it is an eyesore and as such, hanging these by hooks is a far better idea in case you want to have a cleaner look for your kitchen. The image seen here shows how systematic the kitchen looks with these hanging cups. Hooks can accommodate at least dozen of cups of varying sizes and colors, and this helps in adding style to your decor. 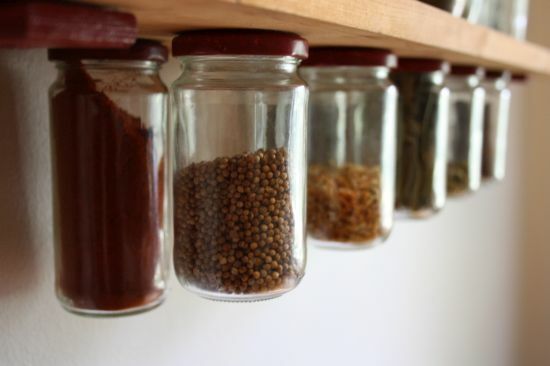 Another clever way to maximize space in your kitchen cabinets is to fit under shelve transparent jars containing a variety of things like grains, sugar, salt and pepper. Doing this will ensure that you keep your cabinets free of over stuffed jars and also do not over stuff your counter top as well. Seen below is a clever idea where the designer has fitted jars under shelves to save on space. A roll or pull out pantry kitchen storage cabinet helps you store as many items as you need without creating an additional place to accommodate these. The roll out pantry seen below is a clever idea for anyone who wants to save on space and does not want to waste time searching for ‘that bottle’ of sauce or condiment required urgently. 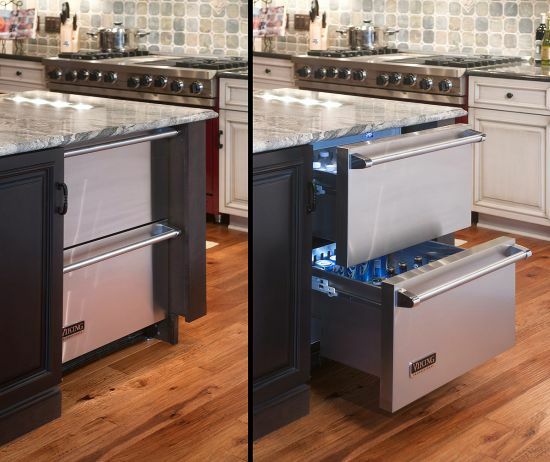 Want to save big on your kitchen’s space but with style? 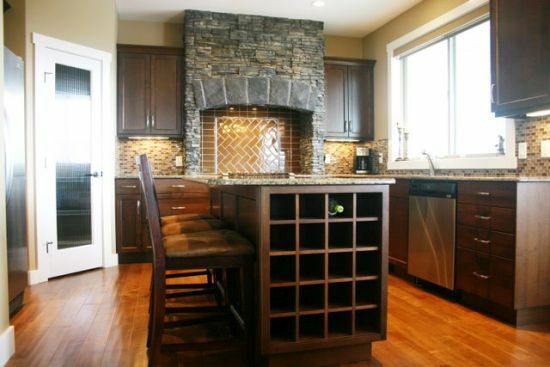 Well, you must install an island that has an inbuilt wine rack for storing wine bottles systematically. The wooden island seen below has wine racks which solves the problem of finding an additional cabinet to store these huge bottles. The look is smart and indeed saves a lot of space. Any kitchen counter top looks congested and cluttered with big stacks of sugar and flour. Hence, in order to save on space, buy decorative pantry jars to store grains and other condiments, and arrange them neatly on the counter top, just like the ones as seen in the image below. These jars not only look crafty but also eat lesser space, thereby allowing you to work freely. 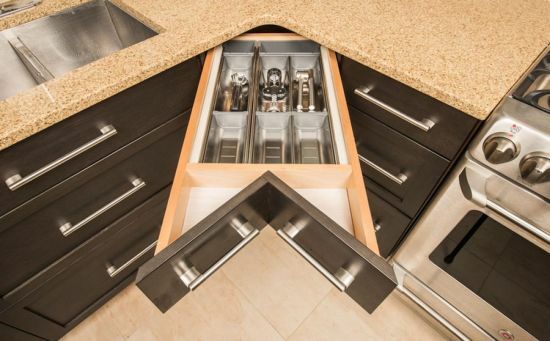 Corner drawers can be installed in between your main kitchen cabinet to store multiple things like spoons, spatulas, glasses and a host of other items that you need in your kitchen. The corner drawer seen below looks classy and helps in saving cabinet space as well. First things first, you need to de clutter your pantry cabinet. Remove all those items that aren’t necessary and keep those that are important. Arrange similar items together like jars with jars, and glasses with glasses and so on. 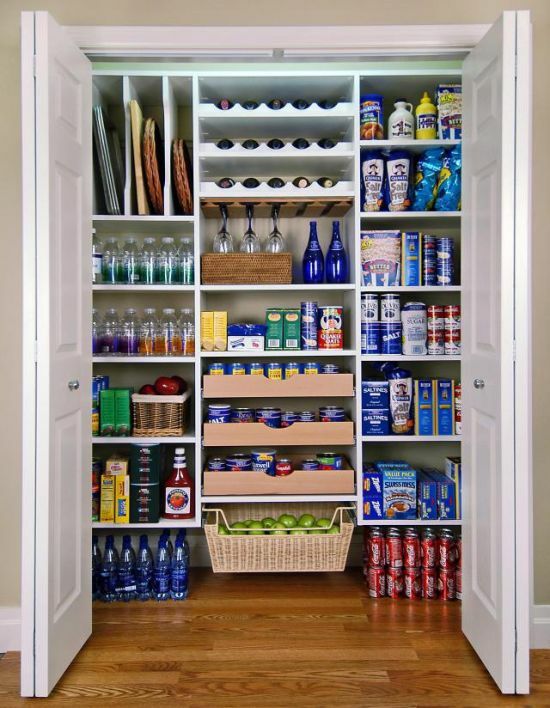 This will help you manage your pantry better and more efficiently just like the pantry seen below where everything is organized properly to enable fast handling. An organized pantry is definitely one of the most effective kitchen cabinet ideas you can come across and this, you must initiate immediately in your kitchen. Seen below is a cupboard kitchen that looks chic and very compact, housing almost all the things and accessories needed for cooking. The cupboard is suitable for small houses or apartments and is built of oak. Some features included here are taps, fridge, microwave and a sink. Having an island that comes equipped with a refrigerator and other features helps you save a lot of space as you get everything together in one place and there is no need to clutter up the kitchen floor unnecessarily. The island seen below has a built in fridge and is multi functional. 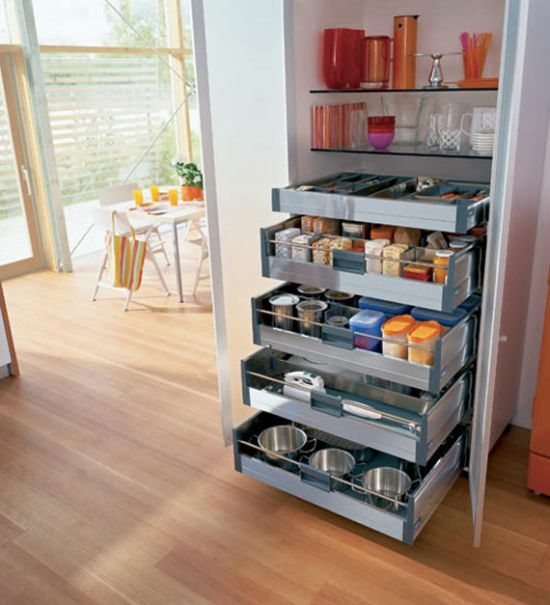 Dish drawers need to be more practical so that they serve full utility and save space. Seen below is a wooden drawer built to store dishes and bowls of varying sizes. The whole drawer is divided into sections so as to fit in as many dishes as possible. 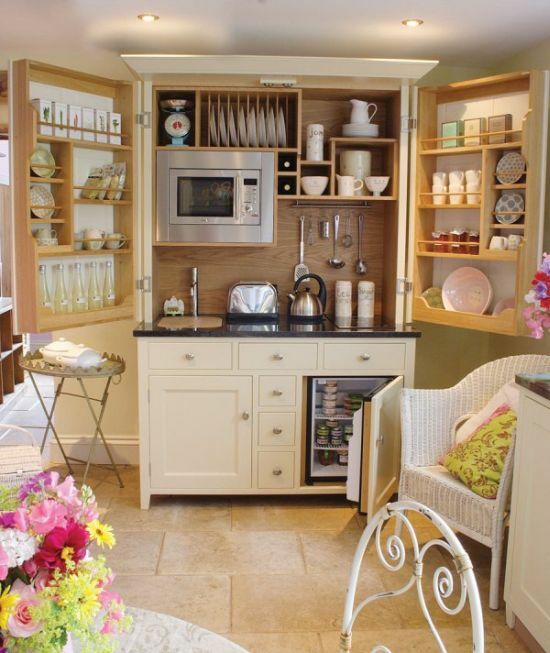 Do you want to hide your microwave or cluttered up shelves when not in use and wish to adopt the best of kitchen storage ideas that help you do the same? If so, pick pocket drawers that can hide away all the features or appliances when you do not wish them to be seen. 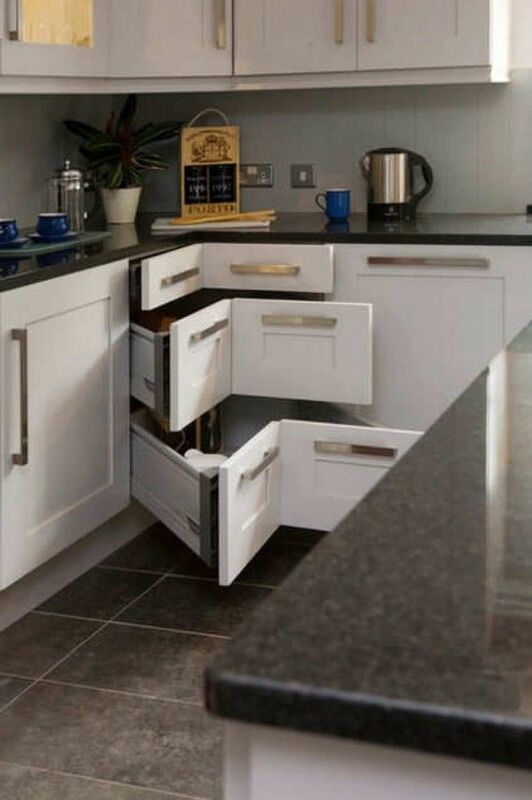 The image below shows how cleverly the pocket drawers have successfully hidden kitchen items from being seen. 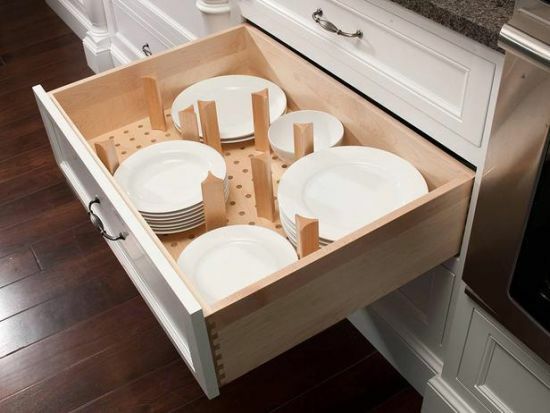 These drawers are functional and offer systematic storage in your kitchen. 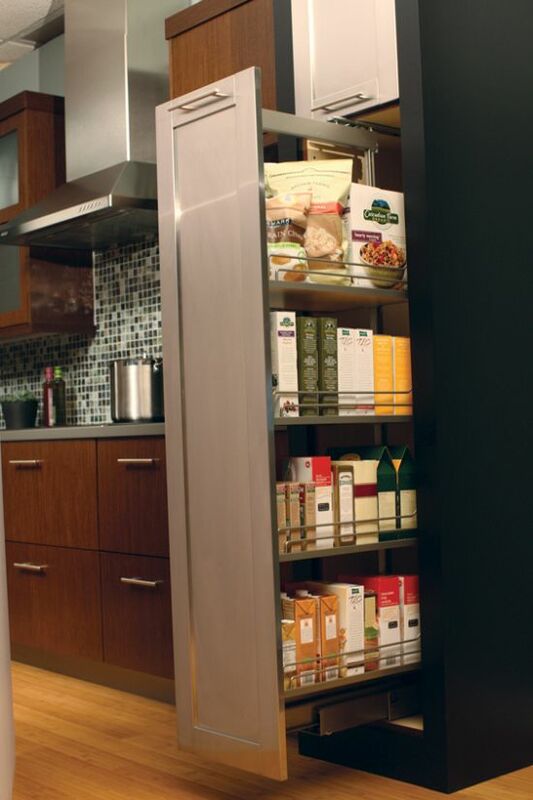 If you need to maximize space in your Kitchen storage cabinet, you must think of ways and means to add extra storage space, either inside the kitchen or outside of it. 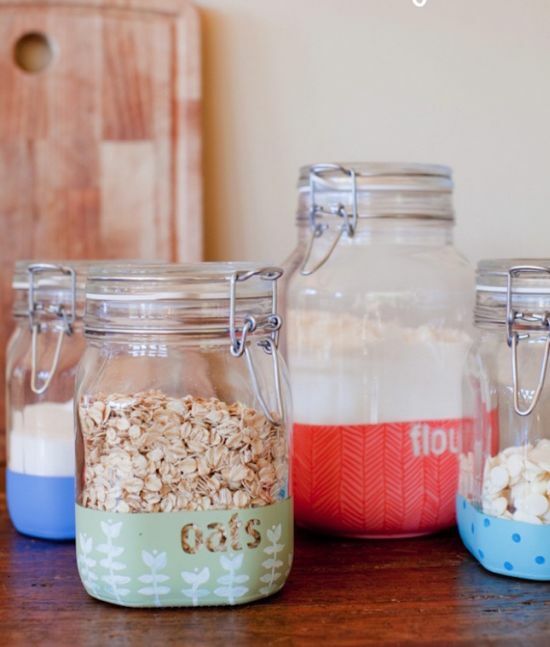 The image below shows how an ordinary cupboard can be used to store things like plastic jars, containers and glasses. While the lower shelves are used to keep jars, the upper most shelve is used for storing glassware. For your kitchen cabinets to look tidy, you need to think of ways to not only create extra storage but also to make storing stylish just like the floating shelves seen below where they have been used to store various kitchen items like jars, mixer, bowls and cups systematically. You can hang some pots and a few pans from a simple wall shelve or rack to save space in your kitchen like the one in the image below. 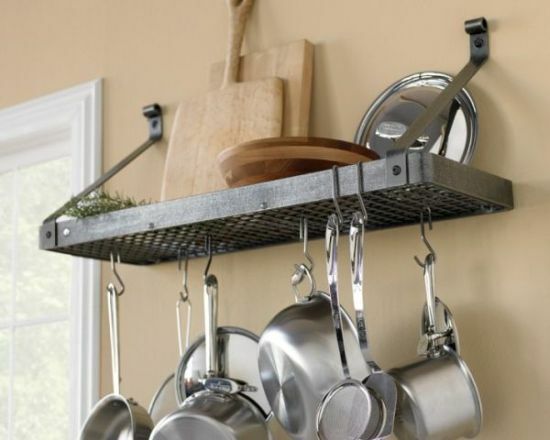 The rack is made of steel and is used to hang and store a number of kitchen utensils. 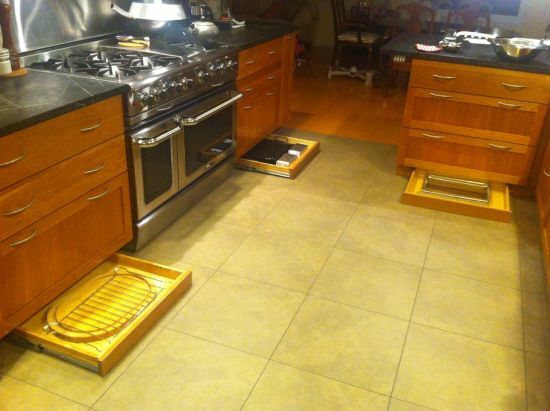 This is a simple way to add more storage space in your kitchen without spending too much. The cabinet is one place that can de clutter your kitchen and there are plenty of ways you can save on space like having a rack built under the cabinet to store spice jars. 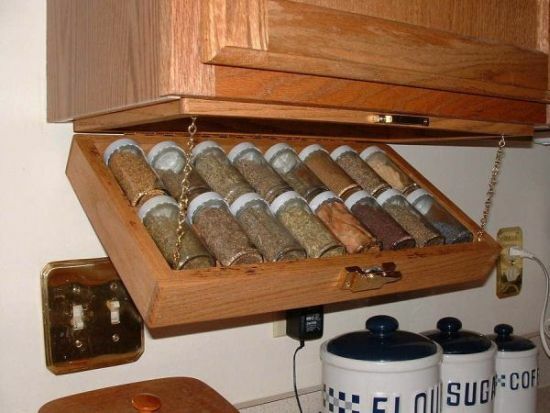 The spice rack seen below has been attached under the wooden cabinet and stores a number of spice jars systematically, thereby, solving your storage problems. The rack can be pulled in and out that makes it more practical. Like shown below, you must put similar things together just like whats been done here. 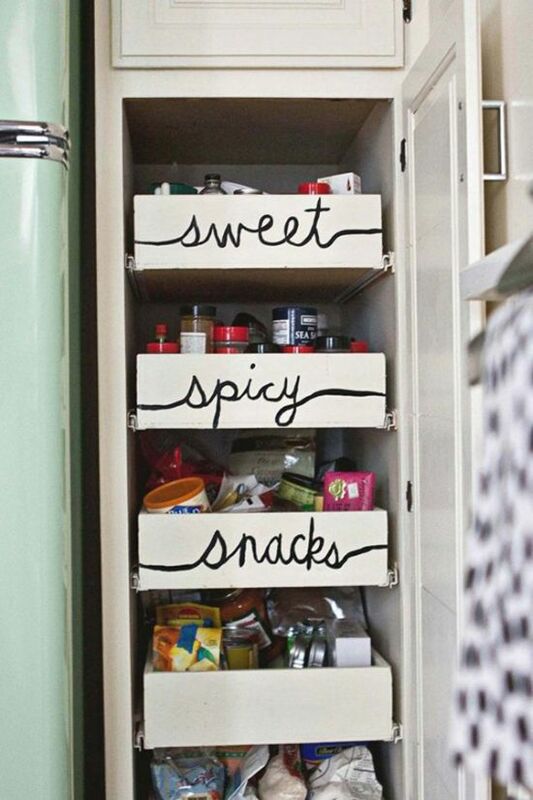 The cabinet has many layers of shelves, one designated for sweet, another for spicy, and the third for snacks. Keeping items like this helps you to find items that are needed urgently and you don’t end up wasting your time trying to find the one particular thing you want. If you need to have an organized feel for your kitchen, you should try arranging kitchenware as per their use. The items that are used frequently must be arranged on the counter top or on lower shelves, and for those that are not needed everyday, they can be stored on upper shelves. 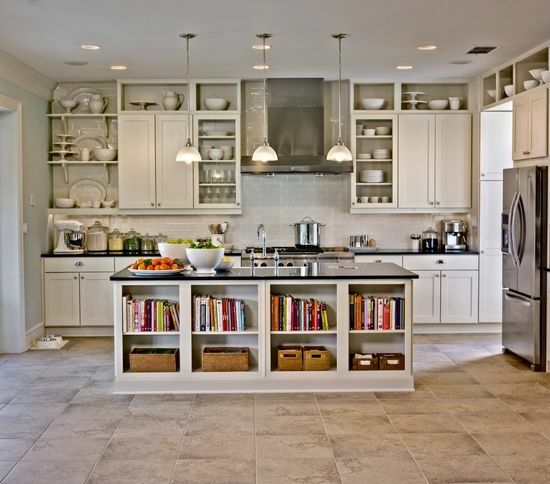 The white cabinets and shelves seen here are used to store crockery that is not utilized everyday, while on the counter top, are seen jars and appliances arranged for easy use. The kitchen cabinet storage ideas showcased above are functional and would help you have a systematic storage in your kitchen. There are plenty of kitchen storage ideas circulating the internet today and all these offer you fantastic and clever ways in which you can solve your clutter problem easily. 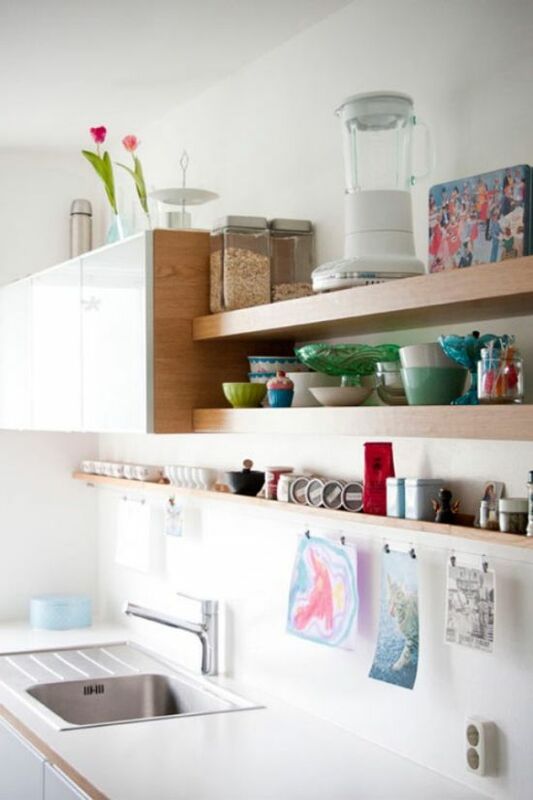 For those that want to keep things minimalist, there are such storage solutions available that do not need lot of money in buying them such as simple floating wooden shelves and minimalist spice racks under cabinets. 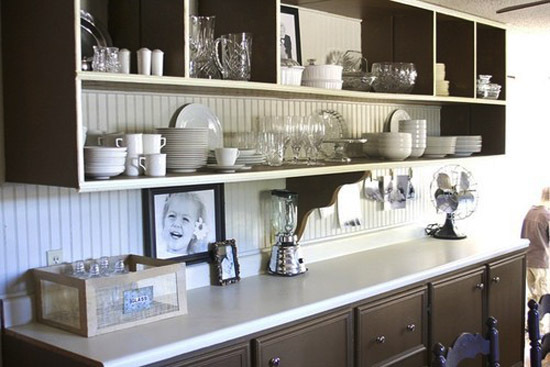 Do take a look at these ideas and de clutter your cabinets today.